Your supporting document for the submission is well informed of your goals and how you set out to achieve them. You made good use and time for gathering that all important research. The images shown in the research section show clear references to your final piece I can see that you made good use of them when going into the production stage. I like that you made the effort to keep both the units in maya and unreal the same as this can cause issues if not done. Your grey box setup I can see helped you get an idea of lighting and proportions of assets before going forward to the production. Your models are well done and at a high standard. The renders of the unit and door really showcase that. I would also like to add that from the beauty shots of the assets that the textures created are spot on and I can really see the amount of hard work gone into creating the feel of wear and tear to give the objects a story to themselves. I see you have a real understanding on what and when not to use certain software for the sake of it. As mentioned you could of used zbrush for your cash register though instead opted for NDO as you had the images ready to convert, saving time which is key for working in the games industry. I’m also pleased to see that you used RMA technique when needed to save on the performance but I do understand when needed to have the separate to have better control. The only major point I would say is try and also optomise you UV space as much as possible you done it well with the cash register however for the shelving unit there’s a lot of empty UV space that you could of used to pack the UV shells together more and scaled the up. 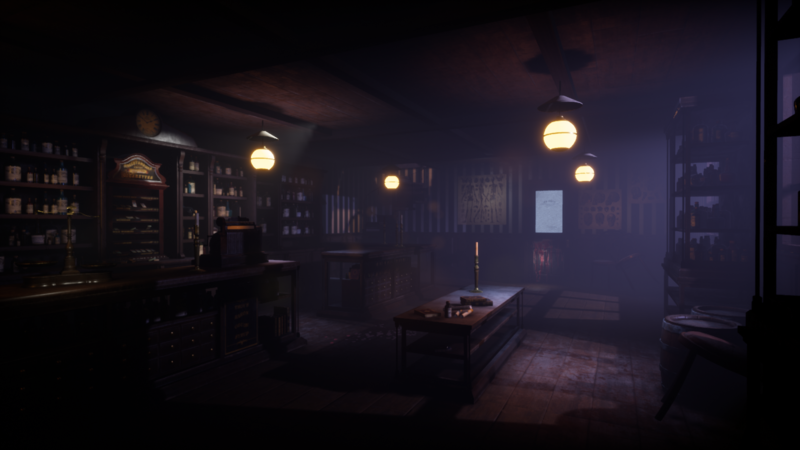 Your unreal work is nicely done with the use of both simple and complex shader work. Though your hard work with the lighting and post processing is what shines out for me. You had a clear goal that you wanted to achieve with this in mind and I can say you have done so. Overall the project is stunning to look at and eye catching with the lighting and mood set. I think you’ve done well to bring it all together and make it stay consistent throughout. Love this. Lots of atmosphere, really great Idea and design. Well done. Your well on track to getting in the Industry if your work is all this quality. 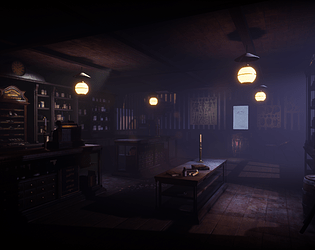 This is a tricky environment to pull off - atmospheric interiors with low level lighting are a subtle balancing act which can cause problems for even very experienced artists. This a is a good attempt with final results that go a long way towards achieving the stated aims of the artist - nice use of fogging and a restrained colour palette help sell the believably of the scene. The scene is somewhat on the dark side tonally however - whilst the aim was for dark and atmospheric, the final renders are a little too far in that direction, which I suspect is being caused by the general wood albedo levels being a little too low. Also, the renders are a touch blurry - UE4's temporal anti-aliasing can often do this to still images, so either changing it for MSAA when taking shots or sharpening them up in photoshop can help with that.